The 95 members of the University Singers have come together to create extraordinary performances at home and abroad. They will end their year with a final concert Saturday, taking on one of Johann Sebastian Bach’s most famous pieces. Looking out at the crowd gathered in an ancient cathedral in the center of Prague, Will Dickinson noticed the elderly woman in a bright blue raincoat, smiling and bouncing along as Dickinson and his fellow University Singers performed a Czech folk song. Touched by her obvious enthusiasm, Dickinson, a fourth-year University of Virginia student majoring in music and religious studies, asked an interpreter to help him speak to the woman after the show and thank her for coming. 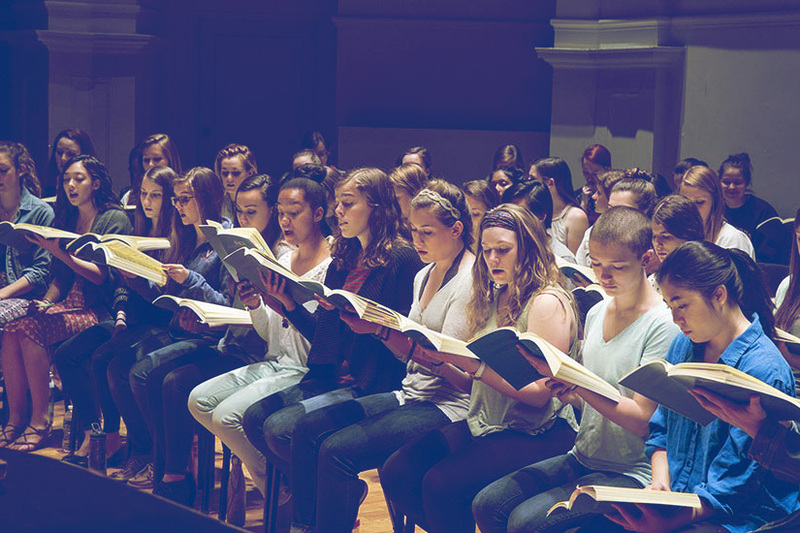 Dickinson is one of 95 students in University Singers, a choral ensemble directed by Michael Slon, an associate professor and the director of choral music at UVA. In addition to performances in Prague, London, Cambridge, Krakow and Vienna last summer, the ensemble has hosted numerous concerts at UVA this year and will give its final concert of the semester on Saturday at 8 p.m. in Old Cabell Hall, performing “St. John Passion” by Johann Sebastian Bach. Fourth-year student Taylor Morgan, president of University Singers, said that the piece has proved “very challenging,” because of the sheer volume of music to learn. The ensemble is known for rigorous performances of classic choral music, such as a 2014 performance of George Frideric Handel’s famous “Messiah,” a long oratorio first performed in 1742, and collaborations with the Charlottesville Symphony on Verdi’s “Requiem” and Beethoven’s Symphony No. 9. Often, that experience includes singing in an unfamiliar language. On Saturday, the singers will perform Bach’s famous oratorio entirely in German (with a translation provided to the audience). The ensemble has performed in several different languages this past year, including Latin, Czech and Polish. Several of those performances came during the University Singers’ international tour last summer, its first international tour in decades. The ensemble visited London, Cambridge, Prague, Krakow and Vienna. The ensemble completes concert tours every other year, typically traveling to schools, concert halls and churches around the U.S. They are also featured in many University events, whether singing the national anthem to open UVA sporting events, performing at convocation or during a vigil held in support of the victims of terrorist attacks, or collaborating with the Charlottesville Symphony for a holiday concert. 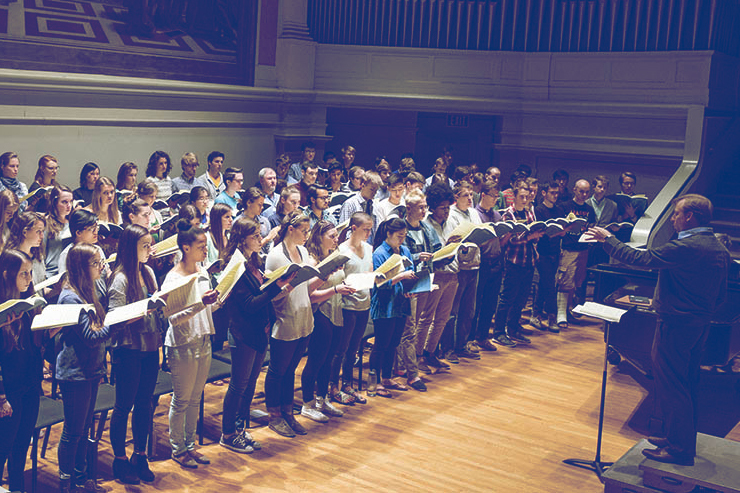 In addition, a select group of University Singers makes up the UVA Chamber Singers ensemble, which performs chamber choir music several times each year. The myriad performances, along with rehearsals every Monday and Wednesday, create a strong bond among the students, Slon said. “I think it is very special that all of these performance experiences bring the group together as a family, where they feel that they have a smaller community within the larger context of UVA, a group that knows them well and appreciates their gifts,” he said. Students hail from all six of UVA’s undergraduate schools, as well as several graduate and professional schools. They receive course credit for their participation and many take on leadership roles, pitching in to handle concert arrangements, create publicity campaigns or lead fundraising efforts. Some are majoring in music, while others have their sights set on different fields. “It is wonderful to be surrounded by people who share a common interest in music but are so varied in their other talents,” Dickinson said. Many former University Singers have gone on to careers in music and the arts, with opera singers and professional choristers numbered among the group’s alumni. One 2012 alumna, Kayla Winslow, is now the lead vocalist for a U.S. Army Band stationed at Fort Carson, Colorado, where she performs for the community and for other troops. Other students, like Morgan, are headed down different career paths, but plan to continue singing outside of work. University Singers will perform Bach’s “St. 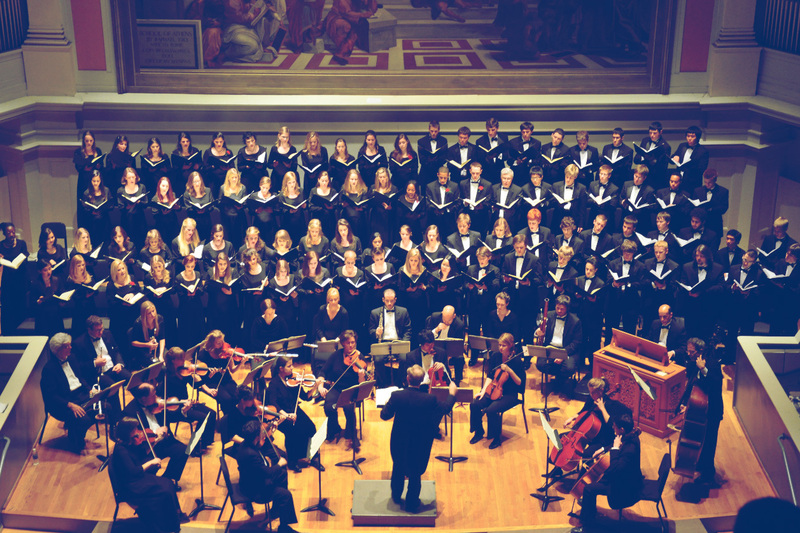 John Passion” at 8 p.m. on Saturday in Old Cabell Hall. Tickets are available at the Arts Box Office at 434-924-3376 or www.artsboxoffice.virginia.edu. They are free for students who reserve in advance, $15 for the general public, $13 for UVA faculty and staff and $5 for students at the door.